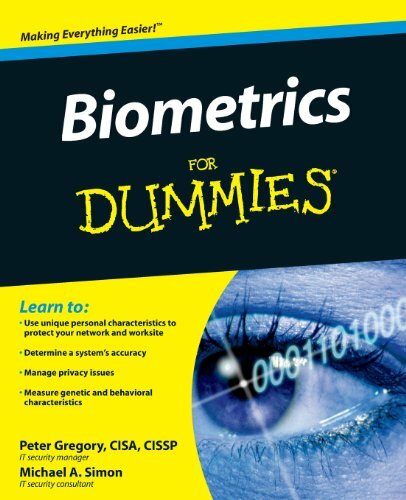 existing security system in your organization, Biometrics For Dummies can help. Here’s a friendly introduction to biometrics — the science of identifying humans based on unique physical characteristics. With the government’s use of biometrics — for example, biometric passport readers — and application of the technology for law enforcement, biometrics is growing more popular among security experts. Biometrics For Dummies explains biometric technology, explores biometrics policy and privacy issues with biometrics, and takes a look at where the science is heading. You’ll discover: How pattern recognition and fingerprint recognition are used The many vulnerabilities of biometric systems and how to guard against them How various countries are handling the privacy issues and what can be done to protect citizens’ privacy How a scan of the palm, veins in the hand, and sonar imagery establish identity What it takes to fully authenticate a signature How gait, speech, linguistic analysis, and other types of biometric identification come into play The criteria for setting up an implementation plan How to use authentication, authorization, and access principles Written by a pair of security experts, Biometrics For Dummies gives you the basics in an easy-to-understand format that doesn’t scrimp on substance. You’ll get up to speed and enjoy getting there!